Olympics’ Social Rings. TV may still be the big marketing vehicle around the Olympics, but sponsors use social media to build buzz and get fans involved. A Third of Adults Now Post to Sites Like Facebook, Twitter Once a Week. The ranks of these networkers, dubbed “conversationalists” in a report released today by Forrester Research, have grown in the past couple of years. They’re mostly women, and they aren’t only young people — 70% of the adults in this category are 30 and older. Ski Resorts and Snow Reports and Social Media: A match made in heaven? The Top 10 North American Ski Resorts Utilizing Social Media. Retailers Lure Moms with Social Media, Free Stuff. The study found that women with children at home are more likely to use Facebook (60.3%), MySpace (42.4%) and Twitter (16.5%) than average adults (50.2%, 34.4%, 15.0%, respectively). Moreover, 15.3% maintain their own blog. Study Reveals Facebook Better Than Twitter for Marketers. Can’t say that it surprises me. Facebook encourages users to aggregate external content on Facebook to be viewed within the network, while Twitter encourages users to link externally, viewing content outside of the network. Led by Facebook, Twitter, Global Time Spent on Social Media Sites up 82% Year over Year. 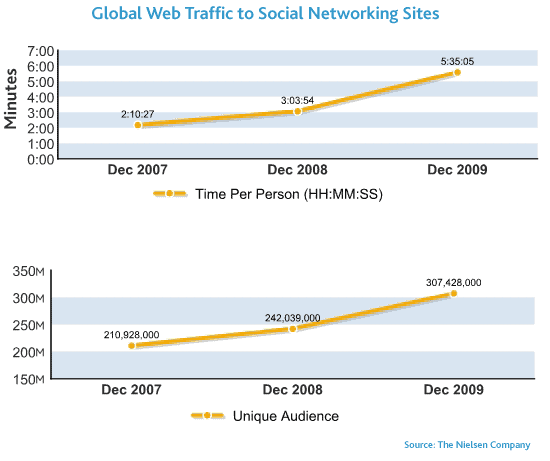 People in the U.S. continue to spend more time on social networking and blog sites as well, with total minutes increasing 210% year-over-year and the average time per person increasing 143% year-over-year in December 2009. Next story How Game Mechanics Can Make Social Networks Addictive?